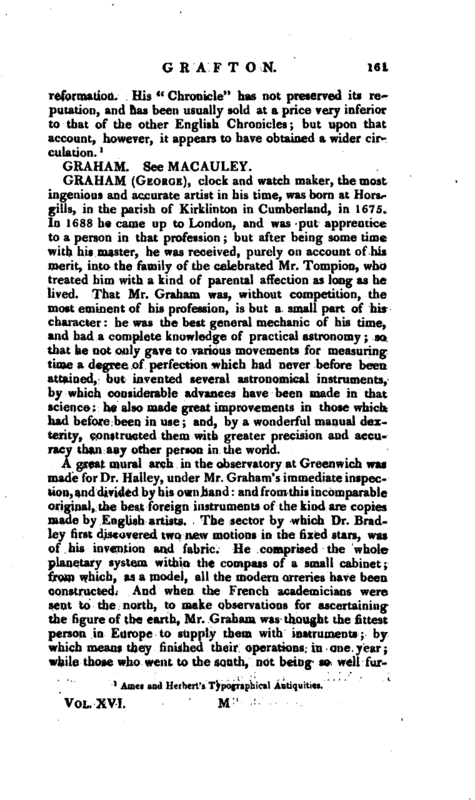 , an English printer and historian, was descended of a good family, and appears to have been brought up a merchant, and his works, as an author, evince him to have had a tolerable education. He tells us himself that he wrote the greatest part of Hall’s chronicle (who died in 1547), and next year printed that work, entitled “The union of the two noble and illustre famelies of Lancastre and Yorke,” &c. continued to the end of the reign of Henry VIII. from Hall’s Mss. according to Ant. Wood. It had been printed by Berthelet in 1542, but brought down only to 1532. In 1562 Grafton’s “Abridgment of the Chronicles of England,” was printed by R. Tottyl, and reprinted the two succeeding years, and in 1572. And as Stowe had published his “Summarie of the Englyshe Chronicles” in 1565, Grafton sent out, as a rival, an abridgement of his abridgement, which he entitled “A Manuell of the Chronicles of England;” and Stowe, not to be behind with him, published in the same year his | “Summarie of Chronicles abridged.” This rivalship was accompanied by harsh reflections on each other in their respective prefaces. 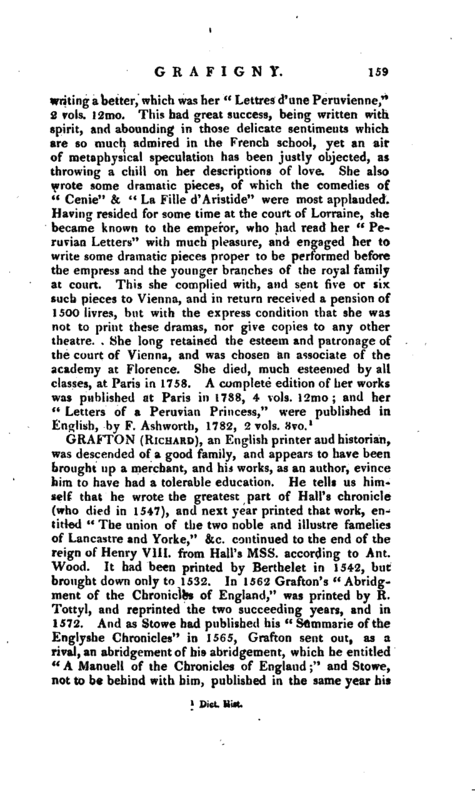 In 1569 Grafton published his “Chronicle at large, and meere History of the affaires of England,” &c. some part of which seems to have been unjustly censured by Buchanan. In the time of Henry VIII. soon after the death of lord Cromwell, Grafton was imprisoned six weeks in the Fleet, for printing Matthews’s Bible, and what was called “The Great Bible” without notes, and, before his release, was bound in a penalty of lOOl. that he should neither sell nor print, or cause to be printed, anymore bibles, until the king and the clergy should agree upon a translation. As Whitchurch was concerned with him in printing those Bibles, he very probably shared the same fate. Grafton was also called before the council, on a charge of printing a ballad in favour of lord Cromwell; and his quondam friend bishop Bonner being present, aggravated the cause, by reciting a little chat between them, in which Grafton had intimated his “being sorry to hear of Cromwell’s apprehension;” but the lord chancellor Audley, disgusted probably at this meanness of spirit in Bonner, turned the discourse, and the matter seems to have ended. 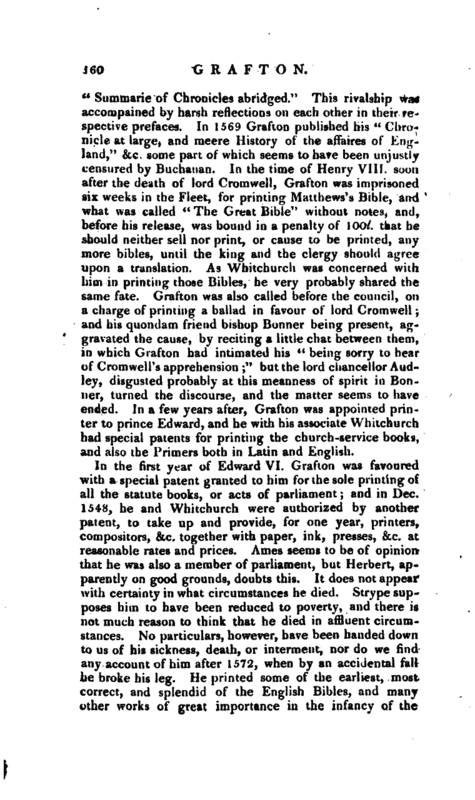 In a few years after, Grafton was appointed printer to prince Edward, and he with his associate Whitchurch had special patents for printing the church-service books, and also the Primers both in Latin and English. Ames and Herbert’s Typographical Antiquities.